Perfect brew for an afternoon in the sun…tropical fruit character dives forward with hints of honeydew melon, guava, orange and lime. Cameron’s inspiration for the perfect American Pale Ale (APA) came from California, the birthplace of the APA style, where the sun, sand, and the waves go hand in hand with great beer. 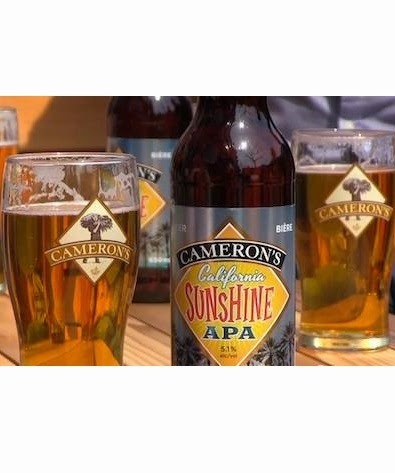 Introducing Cameron’s California Sunshine APA, a sessionable, straw-coloured and golden-hued ale at 5.1 % Alc/Vol. “Cameron’s California Sunshine is a delicious, lighter-bodied beer with a lively, fresh taste,” says Cameron’s Brewmaster, Jason Britton. “The tropical fruit character dives forward with hints of honeydew melon, guava, orange and lime. These flavour notes come naturally from the different hops we use in the brewing process, including Simcoe and Liberty. The juiciness of the hops rounds out the body, leaving a hint of tartness for cleansing the palate and a white webbing of creamy head,” he adds. American Pale Ales can trace their lineage back to British Pale Ales and were born out of the American craft beer revolution in the 1980’s. Even though they were trying to mimic traditional British styles they loved and respected, California brewers created interesting new styles with West Coast hops, which resulted in more piney and citrusy beers. “The latest creation in our Brewmaster’s Series is perfect for an afternoon in the sun, whether on the dock, on a patio, at a barbecue, or on the beach. The art and science of this recipe is that the combination of hops has brought forward refreshing tropical notes to make it a truly sessionable beer,” adds Bill Coleman, President of Cameron’s Brewing Co.
Cameron’s California Sunshine APA is best served at 6-8°C in an imperial pint glass. It is 5.1% ABV (alcohol by volume), and will be available in 650mL bottles at the LCBO (SKU #391524) and Cameron’s Retail Store for $5.95. It is currently being served on draught now at select bars including Tequila Bookworm, An Sibin House, The Rhino Bar and Grill, C’est What, Wurst, and Hair of the Dog Pub.